TGIF, Friends! And welcome December! Today I want to share with you a fun and simple groomsman gift that my son and I made for his I-do crew. Not only is it unique, but something the guys will actually use and enjoy! My son agonized over what to get for his groomsmen as a gift for standing up with him on his special day. He wanted it to be something fun, not super expensive, yet something they would all enjoy. So, after a bit of brainstorming, we came up with an idea that would be appropriate for all of his groomsmen, including his Dad and brother. Because I never throw anything away, I had a large stash of quart size jars on hand. And we happened to have 8 jars, which was the perfect number. My son painted all of the lids gold and then we went shopping! We made several stops. First we went to a local cigar store and he bought a really nice cigar and cigar cutter for each of the gift jars. I had some match books made especially for the wedding that said “A Perfect Match” so we decided to include a pack of those in each jar as well. One definitely needs matches in order to light a cigar, right? Then we stopped at the liquor store and bought mini bottles of Fireball and Jack Daniels. One of both per jar. I later learned they all enjoyed their mini bottles “pre-game”. Here are the kids burying a bottle of bourbon. Folk lore says if you bury a bottle of unopened bourbon, upside down, a month before the wedding, it won’t rain on your special day. I’m happy to say it worked! The groomsmen dug it up and toasted with it as well. Now we know why they weren’t cold! The last stop was at Cost Plus World Market where my son chose some beef jerky and assorted candies. He also purchased some nice brown tags as labels. Some gold, tan and cream gift paper filler to put in the bottom of the jars rounded out the purchases. Then we went home and assembled the jars! My son put a handful of the gift bag filler in the bottom of each jar and added the liquor, cigars, cutters, matches, candies and jerky in each jar. He topped it off with the painted gold lids. 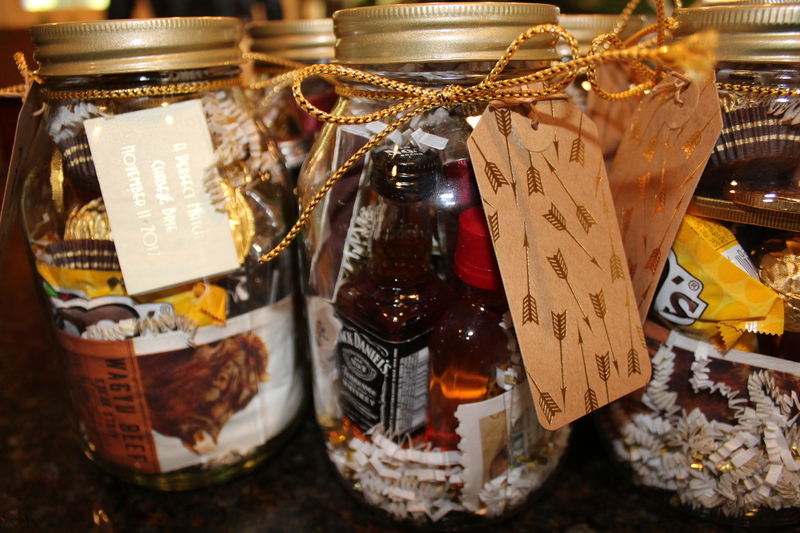 He tied a gift tag to the neck of each jar with gold twine and a note to each of the groomsmen. Each of the groomsmen got a little snack and a drink or two before the wedding in the groomsman suite as they got dressed. They all looked so very handsome in their tuxedos! And a nice cigar to smoke later as the evening winded down. Old school. We both thought the gift jars turned out nicely! My son added a “thank you” sticker on top of each of the gift jars. He really has such a nice group of friends and to have them, his brother and his Dad stand beside him when it mattered most, was perfect. We love each and every one of them too.